In a deep dish 9” pie pan, layer the zucchini, onion, green pepper and tomato. In a bowl, add the eggs, milk, salt, pepper and garlic. Blend until everything is mixed well. Pour egg mixture over the vegetables. Carefully cut the squash blossoms on one side without cutting through the entire flower. 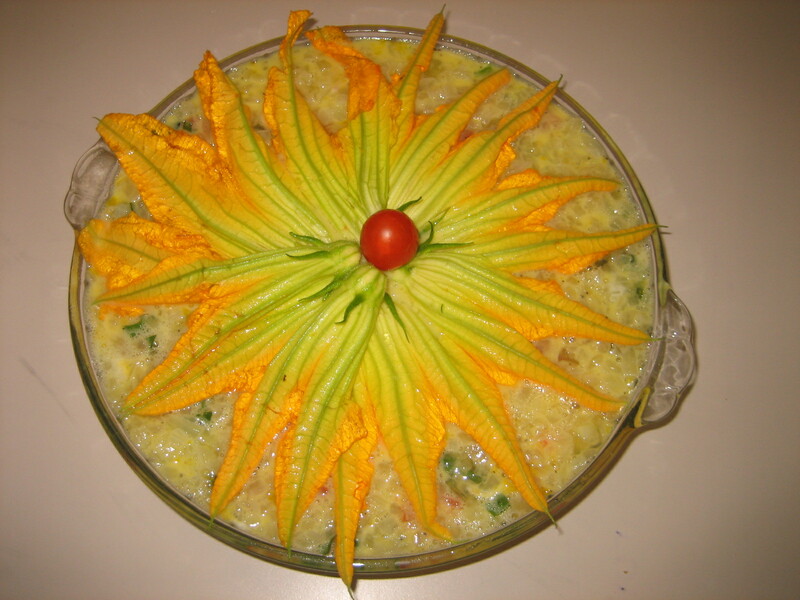 Open flowers and arrange on top of dish in a circular pattern. Add cherry tomato in the center for garnish. Bake at 350˚F, for 50-60 minutes, or until center is set. Let rest for 5 minutes before cutting into it. Serve with fresh fruit and crusty whole grain bread. Posted on August 15, 2013, in Denise's Delightful Dishes and tagged cooking, flowers, herbs, onions, peppers, squash, squash blossom, swiss chard, Tomatoes, vegetable gardening. Bookmark the permalink. 2 Comments. A nice recipe and a lovely presentation.